A direct continuation of Far Cry 5, in which we find ourselves in a postapocalyptic version of the American state of Montana. Far Cry: New Dawn is another part of the best-selling FPS series, made by Ubisoft. For the first time in the history of the cycle, the developers decided to create a direct continuation of the previous production from this signboard - in this case Far Cry 5. Action game Far Cry: New Dawn takes place after the events presented in the Far Cry 5. Seventeen years have passed since the nuclear war, of which North America, among others, was a victim. The nuclear winter has already receded, and it was followed by the so-called "super bloom" - the earth is overgrown with dense vegetation, especially colourful flowers. During the game we get to the postapocalyptic version of Hope County. As a self-created heroine or heroine, we have to deal with an army of dandruffers called Highwaymen, which travels all over the country (or rather what's left of it) and is headed by two black twins, Mickey and Lou. The protagonist can use the help of allies, among which there are inhabitants of the Prosperity settlement, which is his base, as well as the Akita dog named Timber or even an overgrown wild boar - Horatio. Pets, just like sniper Nana, feed the ranks of the so-called "guns for rent". Far Cry: New Dawn does not differ from the scheme developed for the previous parts of the series. Once again we receive a shooter with an open world, where we can move on foot or at the controls of the vehicle. It is worth noting that only a part of the map from the Far Cry 5 is available, as the rest of the county still has a high level of radiation. In addition to pushing the action forward, during the game we perform side missions and take part in a variety of optional activities. One of the latter is deflecting enemy posts that can be seized or only plundered (if we decide on the latter, the bandits will return to such a place and fortify them anew, which will make the next attack much more difficult). The game also does not lack accidental meetings (although there are a little less of them than in the Far Cry 5), animal hunting or even treasure hunting. In addition, production allows us to set off with an expedition to other parts of North America on board a special helicopter; thanks to this we can visit, among others, the Great Canyon of Colorado, where enemies also have their fortresses filled with supplies. Due to the fact that the game world is full of dangers (individual opponents appear here in several variants differing in terms of look, endurance and firepower), an extensive arsenal including machine guns or a unique crossbow shooting with sharp shields has been placed on our armoury. The fun is diversified by crafting, which plays a greater role here than in the previous parts of the series. Raw materials obtained during our voyages can be used not only for the improvement of existing weapons, but also for the improvement of the settlement, provided by the so-called specialists. Resources are also required for the use of vehicles (headed by a helicopter). 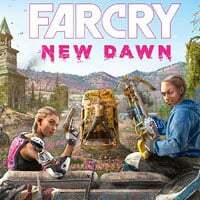 As with the fifth installment of the cycle, Far Cry: New Dawn can be played alone or in the company of a second player as part of a cooperation mode. Far Cry: New Dawn is based on the proven Dunia Engine technology. The three-dimensional graphics of this production presents a quality similar to that of Far Cry 5. Far Cry New Dawn guide is a collection of the best tips and a description of the passage of this fps shooter. From our publication you will learn what skills are worth attention, where are the secrets and how to hunt. There is also a detailed walkthrough.